Azerbaijan is one of the countries where mud volcanoes are most widespread. Over 350 mud volcanoes are located in the Absheron peninsula and the Caspian Sea. Mosto volcanoes are active throughout the year and only 43 of the mud volcanoes are protected by the state. For security reasons, the admission of people there is prohibited. Some of the volcanoes may pose a threat to the people and their homes located nearby. Bozdag Gobu and Keyreki volcanoes located on Absheron peninsula may cause serious threat to the people living around it, the head of the mud volcanism department of the Institute of Geology and Geophysics of ANAS, Doctor of Geological and Mineralogical Sciences, Adil Aliyev told Trend. He noted that mud volcanoes received the status of natural monuments in 2002 in accordance with the law “Specially Protected Areas and Districts” and the order on the Establishment of the State Natural Reserve of Mud Volcanoes in Baku and Absheron Peninsula was signed in 2015. Thus, destruction, pollution of the volcanoes and the construction of residential buildings in the nearby territories were prevented. Unfortunately, at present there is a large residential area in the protected area of the Keyreki volcano, near the Binagadi settlement, whereas there were just three individual homes in 2001. Aliyev also mentioned that the Keyreki volcano is active and frequently erupts. He recalled that the same volcano erupted last time in 2017. “The carbon dioxide itself is very damaging to the health of the people living there, although the volcano eruption does not cause an ignition,” he explained. Aliyev noted that the same situation has occurred near Bozdag Gobu volcano as the number of houses near the crater has increased. Earlier, Aliyev said that an eruption of six mud volcanoes is expected in Azerbaijan in the next months and in 2019. There is the likelihood of an eruption of the Bozdag Gobu volcano on the Absheron peninsula, the Bahar volcano in the Alat village, the Shekikhan, Nardaranakhtarma, Ayazakhtarma and Shikhzerli volcanoes in Gobustan, he said. 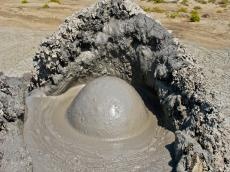 The activity of mud volcanoes is closely linked to the seismicity of the Azerbaijani territory. Mud volcanoes are one of the key points for the discovery of oil and gas fields. In the 1920s, a prominent researcher, Professor D.V. Golubyatnikov called the mud volcano “free exploration well”. According to geologists, mud volcanoes are formed as a result of extreme pressure of hydrocarbon gases accumulated in oil fields. Volcanic water is widely used in the treatment of a number of diseases-nervous system, skin diseases, radiculitis, urology, gynecology and etc. Clays of mud volcanoes are considered to be minerals. Fluid of mud volcanoes is used as raw materials in chemical and construction industry, as well as in pharmacology.